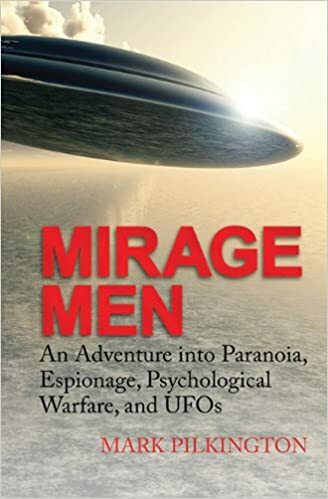 In UFOlogy today, the term "Mirage Men" is understood to signify supposed shadowy government agents who, for inscrutable reasons, are allegedly tricking the public not by "debunking" UFOs, but creating belief in UFOs and the like. The title comes from a book by the British author Mark Pilkington, Mirage Men: An Adventure into Paranoia, Espionage, Psychological Warfare, and UFOs. 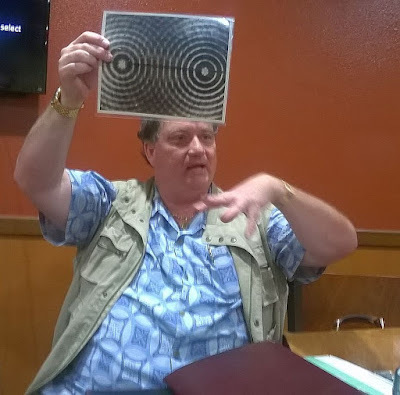 I would also suggest that, from my limited interactions with John Lundberg, and from knowing of his connection with the deliberately enigmatic Crop Circle makers, he is also "not a man who gets directly to the point." From the standpoint of the skeptic, these are interesting claims. There are no ETs, and government Spooks created belief in UFOs. The problem is that, upon close examination, their evidence is very "soft." It suggests a possible involvement of intelligence agencies in a few cases, but no clear motive behind it, and no solid proof that agencies led (or mislead) the public to create belief in UFOs. Ironically, James Oberg has documented several clear-cut instances of government agencies encouraging public belief in anomalous celestial phenomena - but in the USSR, not here. For example, on September 20, 1977 thousands of people in northwest Russia and in Finland saw a brilliant object in the pre-dawn sky that came to be known as the "jellyfish UFO." He notes how a party-controlled periodical (there were no other kinds at that time) published an article by a chemistry professor, claiming that the people had in essence seen "swampsky gas," luminescent industrial effluvia. The Soviet leaders preferred to have the public believe that absurdity, rather than admit it was a rocket launch from a secret space facility that officially did not exist. One researcher who has been promoting the Mirage Men concept in a big way is James Carrion, who served as the International Director of MUFON from 2006 to 2009. I heard Carrion give a talk in 2008, and spoke with him a bit afterward. I realized at once that he was very different from the typical MUFON leader. 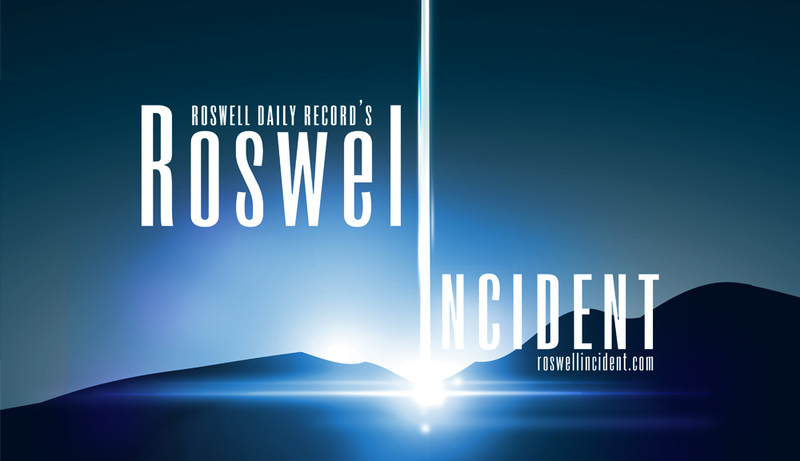 Not even willing to defend Holy Roswell as an E.T. 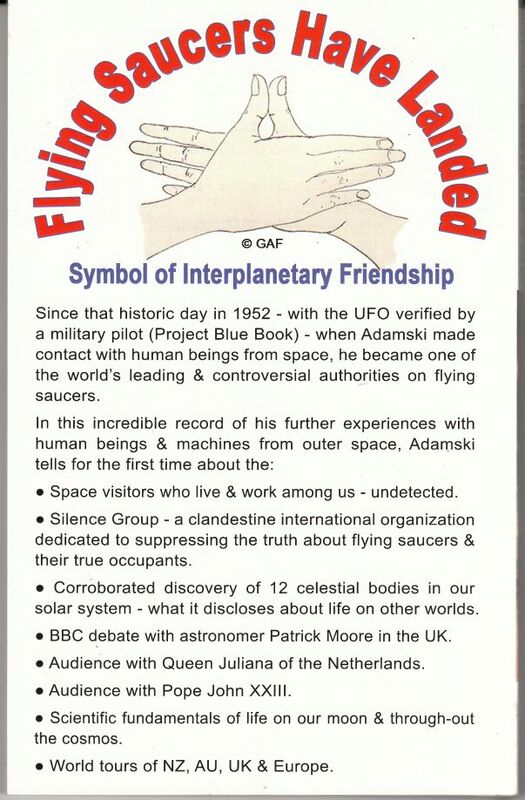 event, he was far too independent a thinker to fit in well at MUFON. 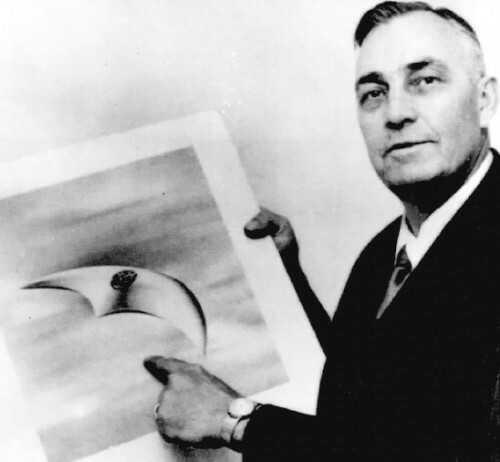 It was no surprise when Carrion and MUFON went their separate ways, with him proclaiming that the UFO phenomenon "is based in deception - of the human kind." 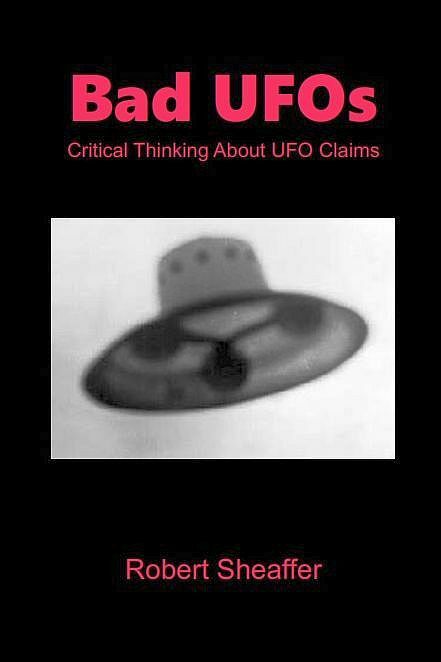 He cited several very interesting examples of such deception, although none of them involved official agencies (see my book Bad UFOs, p. 4). “For Further Details Concerning Flying Disks Suggest Immediate Contact Of (blacked out) Illinois Who May Have Important Information Concerning Their Origin.” Unsigned. desired the Bureau conduct some investigation of Shaver to determine whether or not he has any information pertaining to the origin of the flying saucers. This, says Carrion, "unequivocally documents the connection between US strategic deception planners and early UFO events by relating how Colonel Carl Goldbranson petitioned FBI assistance in investigating UFO events. Goldbranson was a WW2 member of Joint Security Control and one of its principal deception planners." 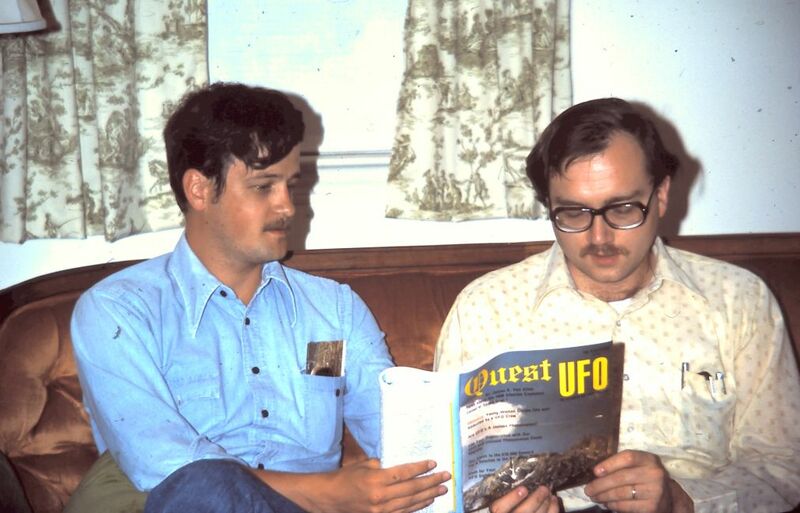 Jack Brewer promoted Carrion's findings in a posting on his Blog The UFO Trail, titled "Mirage Men Conclusively Linked to UFO Summer of '47." Goldbranson "desired the Bureau conduct some investigation of Shaver to determine whether or not he has any information pertaining to the origin of the flying saucers." 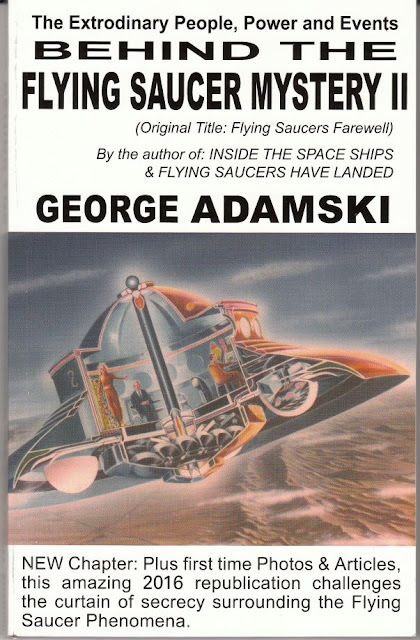 So, am I correct in understanding that Col. Goldbranson was asking the FBI investigate Richard Shaver to see what he knows about the origin of the flying saucers? Shaver, the guy who claimed that underground robots are fighting in caves? This marks Goldbranson as an obvious crank. 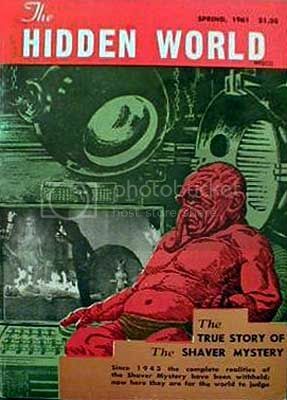 drawing on his "racial memories," Shaver described in great detail the activities of a midget race of degenerates called "deros" who live in huge caverns beneath the surface of the earth. By means of telepathy and secret rays, the deros are responsible for most of the earth's catastrophes - wars, fires, airplane crashes, shipwrecks, and nervous breakdowns. Robert...I don't think you can describe the guy who planned the D-Day deception plans as well as the deception plans for the invasion of Japan a "Crank". Actually, your logic is nonsensical. For example, during WW2, the allies recruited an astrologer to try and influence Hitler and went to great lengths to have this astrologer's predictions "come true" to bolster his credibility. That did not make the deception planners cranks. The deception planner's goals cannot be diminished to simple guilt by association, just because you don't understand the overall goals of the deception plan. If Goldbranson actually thought that Shaver's writings were anything other than 100% fiction, then he was a crank. Or thought that the FBI could learn anything worthwhile from Shaver. 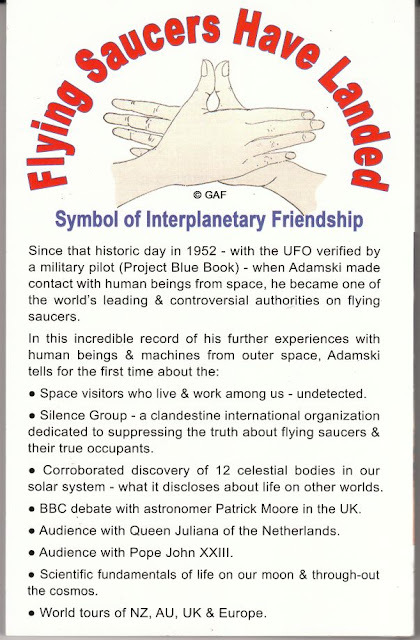 So, is this the entire "proof" of "how Colonel Carl Goldbranson petitioned FBI assistance in investigating UFO events"? That he asked the FBI to interview the wacko Shaver? Anyway, if nobody knew about this request, it wouldn't be any good as a "deception". [Carrion's] "proof" is what is now his central figure in the entire plot, a "Col." Carl Goldbranson, and an FBI memo of July 21, 1947, released decades ago. But Carrion has so far failed to prove that Goldbranson did anything more than ask the FBI to investigate a notorious character who supposedly knew the origin of flying saucers and whose location and timing supposedly coincided with certain incidents in early July 1947.... Carrion apparently missed the fact that it was the infamous Richard Shaver whose name got through the document censors in one place of the FBI memo. Yes, the Richard Shaver of the lunatic Shaver Mysteries, full of "deros" or "deranged robots" -- the so-called robots who were not actually even robots (how deranged is that?!?) -- and Lemuria tales. Carrion has failed even to prove that Goldbranson was continuing his wartime deception duties 2 years after the war, in peacetime, in the face of his FBI memo placing Goldbranson in the wrong agency (Army Intelligence), not on the deception staff (Joint Chiefs). Right now, Carrion has not even proved that his crucial proof, Goldbranson, even worked on deception operations in 1947. Maybe he did, but no such proof is given, it's just hinted at, and insinuated, Goldbranson "would" have been perfect to "fill that billet." But did he? Carrion makes a crucial mistake in misreading Goldbranson's rank as of mid-1947 (his source seems to say G was a Lt. Col. and not full Colonel until December 1948). This means Carrion has the wrong guy on the wrong staff of Joint Security Control even by his own argument. Carrion published a reply to Sparks later that same day, but I don't think it adresses Sparks' main points. In my view, those hunting for Mirage Men supposedly promoting the Flying Saucer phenomenon are themselves chasing a mirage. 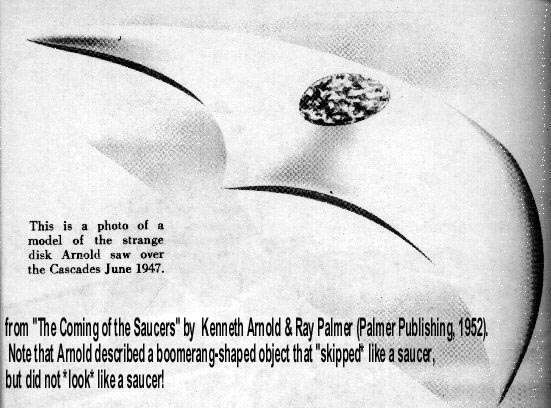 There have been various explanations suggested for Kenneth Arnold's very first sighting on June 24, 1947 of what came to be known as "flying saucers" (owing to a famous error, since Arnold described boomerang-shaped objects, not saucer-shaped ones). In 1953, Menzel suggested that Arnold had seen clouds of snow blown from the mountains south of Mt. Rainier. According to Maccabee, such snow clouds have hazy light, not the mirror-like brilliance reported by Arnold. Further, such clouds could not be in the rapid motion reported by Arnold, nor would they account for Arnold first seeing the bright objects north of Rainier. In 1963, Menzel proposed that Arnold had seen orographic clouds or wave clouds; Maccabee says that this conflicted with testimony from Arnold and others that the sky was clear, and again can't account for the objects' reported brightness and rapid motion over a very large angular region. 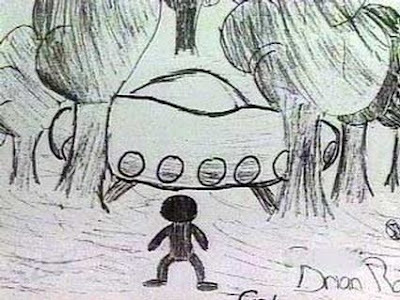 In 1971, Menzel said that Arnold may have merely seen spots of water on his airplane's windows; Maccabee says that this contradicts Arnold's testimony that he had specifically ruled out water spots or reflections shortly after seeing the nine UFOs. For example, the early Bill Bequette article of June 26 in the East Oregonian has Arnold saying he at first thought that maybe he was seeing reflections off his window, but "he still saw the objects after rolling it down." The late Philip J. Klass suggested that Kenneth Arnold probably saw Meteor Fireballs. 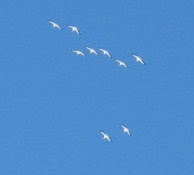 The British researcher James Easton was the first to suggest that what Arnold actually saw was a flock of American White Pelicans, the largest birds in North America. The object depicted above does look somewhat bird-like. But Jerome Clark and many other UFOlogists mocked that conclusion, calling it "Pelicanism." The British Fortean writer John Rimmer defiantly began using the pen name, "the Pelicanist." The reason I am writing about pelicans now is that I just found out that, unlike many species, white pelicans habitually soar on thermals, like hang gliders, especially when they are traveling long distances in search of food (hat tip to Barbara Graham). And when pelicans are soaring, their wings do not move. Indeed, the author of this YouTube video writes how a "white pelican flock rides the wind over Bayou Corne for 10 minutes and never once flapped their wings." Another aspect of Arnold's sighting was an unexpected "flash" of light that caught his attention. He said, "they seemed to flip and flash in the sun, just like a mirror." A fact that few people seem to know is that a flock of pelicans, when soaring, appear to "flash" when their white bellies are turned toward the observer, then fade again as their dark wingtips are turned toward the observer once again. In the YouTube video above, we see the pelicans appear to "flash" at about 57 seconds, then again at about 1:20, 1:42, and 2:00. Pelicans soaring above Lake Tahoe (www.tahoeculture.com). Compare the shape of these pelicans soaring over Lake Tahoe with the shape of the object Arnold drew. Remember that when pelicans are riding thermals, their wings do not move. An amazingly long and detailed investigation, The Singular Adventure of Mr. Kenneth Arnold (147 pages), by the Scottish UFOlogist Martin Shough - tells everything you ever wanted to know about the Arnold sighting. He concludes that the objects Arnold described could not have been birds or other prosaic objects, but does not suggest what he thinks they were. "I noticed to the left of me a chain which looked to me like the tail of a Chinese kite, kind of weaving." "I, at first, thought that they were geese because it flew like geese." "Maybe it would be best to describe their flight characteristics as very similar to a formation of geese." He also once compared the objects to a flock of "blackbirds." Arnold has been telling us all along that the objects reminded him of birds, but we didn't seem to be listening, with our minds fixated on something else. In these interviews with reporter Bob Pratt, Arnold gives us good reason to doubt his credibility. He talks about "mystery submarines," says that his phone line has been tapped, that UFOs may be alive, and they seem to be able to read his mind. He says he has spotted UFOs "seven or eight times." Silas Newton was the main informant (or misinformant) concerning the supposed saucer crash at Aztec, New Mexico in 1948, made famous by Frank Scully in his book Behind the Flying Saucers (1950). Thoroughly debunked by J.P. Cahn in a 1952 article in True magazine, followed by a second article in 1956, interest in the supposed Aztec crash all but disappeared. 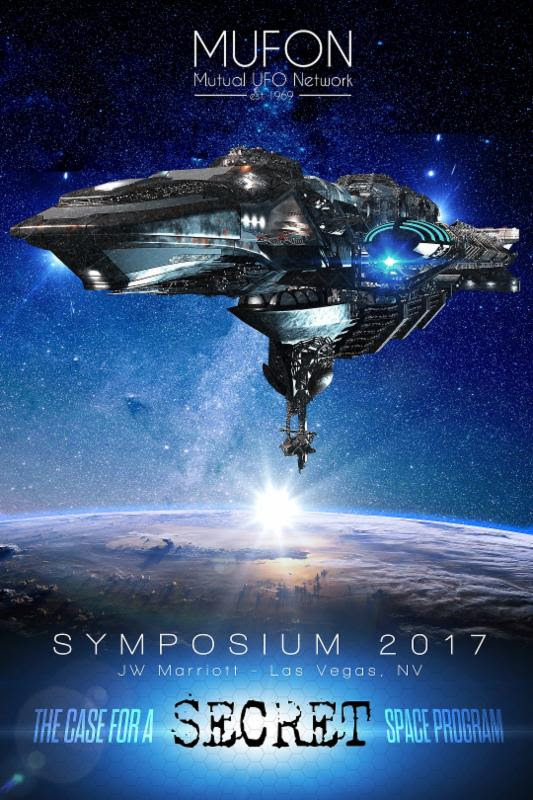 However, in recent years interest has been building up again, largely because of Scott and Susanne Ramseys' The Aztec UFO Incident (2012, revised 2016, http://www.theaztecincident.com/ ). I have previously published a review of the 2012 edition of that book. The FBI's website describes Newton as "a wealthy oil producer and con-man who claimed that he had a gadget that could detect minerals and oil." Aztec crash aficionados describe Silas Newton as a multimillionaire geophysicist, who famously rediscovered the Rangely oil field in Colorado. But the Silas Newton in the skeptical literature is a completely different person: a professional con man without scientific credentials, who made up the Aztec crash story for one of his con games. Which Silas Newton is the real one? A search of newspaper reports and oil-industry literature can find no such fame, and, after all, a person cannot be secretly famous. Quite the contrary, Silas Newton drilled one dry hole after another, until he was broke and in debt. I’m still researching his drilling records, but the following is what I know so far, for the period starting in 1937. For his lack of success at Rangely field in Colorado, see below. 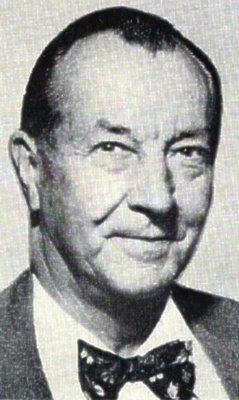 In Kansas, Newton drilled one dry hole and at least one producer; his FBI file from 1941 mentions “three small producing wells” in Kansas, giving him about $200 per month. In California, Newton drilled 6 dry holes, and no producers. In Wyoming, he drilled 7 dry holes, and no producers. In Arizona, he drilled 6 dry holes and no producers. It’s no shame to drill a dry hole on a wildcat location, if you have good reason to think there might be oil there, but Newton was the opposite of “wildly successful”. Frank Scully started this nonsense when he passed along Newton’s bragging that he had “rediscovered” the Rangely Oil Field in Colorado. Newton did no such thing, and Rangely appears to have been a financial debacle for him. Now The Aztec UFO Incident shows how myths grow in the retelling, by changing the single Rangely Field into the plural “fields.” Of course, the book does not name these additional oil fields where Newton supposedly worked his magic. Silas Newton was convicted of fraud, but escaped going to jail. The authors support this with a newspaper article from 1930, about 20 years previous to the period in question. And it may have been true in 1930 (although Newton’s finances appear to have started to unravel in 1929, with the crash), but by the late 1940s, Newton was being dunned by creditors, and in 1952 could not afford his $5,000 bail. 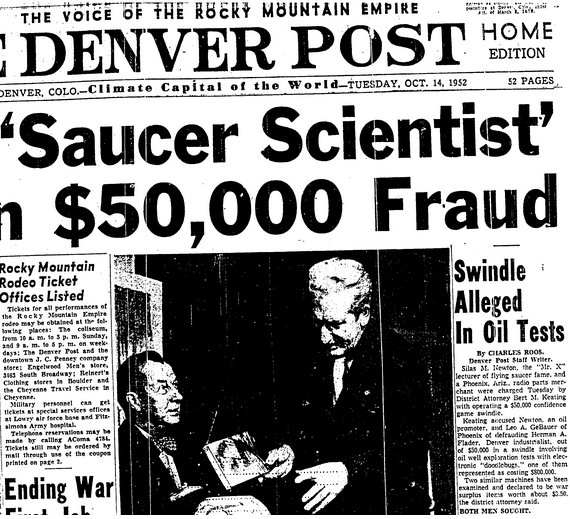 Page 100 of The Aztec UFO Incident even shows an article from a Denver daily newspaper, Oct. 19, 1952, discussing Newton’s inability to pay his bail. Did Silas Newton “Rediscover” the Rangely Oil Field? Silas Newton’s most touted alleged accomplishment is the rediscovery of the Rangely oil field in Colorado. You see much the same thing repeated throughout the Aztec UFO-crash literature. Always paraphrasing Scully: Silas Newton, the geophysical genius, the famous oil-finder, “rediscovered” the Rangely oil field in Colorado by using a secret geophysical device. But is it true? To anyone familiar with the history of oil in the Rocky Mountains, or who bothers to do even minimal literature search on the history of Rangely, the answer is obvious: Silas Newton did not discover, or “rediscover,” anything at Rangely field – not one thing. Let’s review the history of Rangely oil field. The deep Weber oil pool would later catapult Rangely into the most productive oil field in Colorado, but at the depression oil prices of 1933, the oil flow from the deep well at Rangely was not enough to pay for the cost of deep drilling and trucking from the remote location. No more deep wells were drilled at Rangely for the next ten years, but oil men remembered the California Company’s discovery. And far-thinking major oil companies bought up the oil rights over the Rangely anticline, betting that oil would not always be cheap. So, where does Newton’s “rediscovery” fit in? What was Newton’s contribution to discovering or rediscovering the oil at Rangely? Absolutely none. No doodlebug was used to discover Rangely, and none was needed; it was drilled because such anticlines were obvious places to drill for oil. Newton never even saw Rangely until nine years after the deep Weber discovery. He was just one of the many latecomers who flocked to Rangely to see if they could find some oil that the others had overlooked. By his own account, Newton visited Rangely for the first time in 1942, and tried to find some oil leases. Unfortunately for Newton, the best part of the field was already owned by three majors: the California Company, the Texas Company (Texaco), and Stanolind (Amoco). They all knew that they were sitting on a bonanza, and were not interested in selling. But Newton found John Bockhold, a small-time oil man from Kansas who had leased about 3,000 acres along the south edge of the Rangely anticline, but needed to sell his lease to pay some debts. Newton gambled that the deep Rangely field would cover a much larger area, and he bought the 3,000 acres of oil leases for $250,000, a high price at the time. But Newton talked his way into paying only a small sum up front, with the rest to be paid from future oil production. Now he had a sizeable oil lease; but did any of it have oil? The Weber sandstone at Rangely is a classic structural oil field: it is shaped like an elongate inverted bowl. The oil floats on top of the water, so that if you drill the top of the bowl, you find oil; if you drill too far down the sides, you find only water. Only no one yet knew exactly how much of the bowl was filled with oil. Newton’s lease included part of the south flank of the structure, so with a bit of luck, he would find oil in the northernmost part of the lease. With a lot of luck, he would find oil under a significant part of the lease. Newton’s first partial ownership in a successful deep well at Rangely was the Wasatch Oil Gentry #2-D, which started drilling in February 1945. When the well was tested in September 1945, Silas Newton proved himself a master of public relations. The Steamboat Pilot in nearby Steamboat Springs printed the headline “Newton Oil Co. Strikes Gusher at Rangely.” Beyond the fact that a couple of hundred barrels per day is far below the “gusher” class, the Pilot article neglected to even mention that it was the Wasatch Oil Company that actually struck oil, because the well was a joint venture between Newton and Wasatch: For ease of drilling, Newton drilled the shallow part of the hole with his cable-tool drilling rig, then Wasatch Oil moved on with rotary drilling equipment, drilled the deep part of the hole, and completed it as an oil producer. But even though he owned only a partial interest in the well, Newton tried to take all the credit. So by June 1946, after more than two years of drilling, Newton had drilled three dry holes, and owned partial interests in one oil well completed by another company. This was a very bad record for a development drilling project, which should have carried minimal risk. And it was now clear, although Newton did his best to deny it, that, at best, only the very northern edge of his large lease was prospective for oil. For reasons difficult to explain, Newton also drilled a well that he knew, or should have known by then, was too far south to be in the oil pay: the Newton Oil Government #14F. Newton said that he had drilled the well based on geophysics, and loudly insisted that the Government #14F had found oil in a new oil pay, the Dakota sandstone, although many in the oil industry doubted him. After a lot of typical Silas Newton overblown publicity, the well was finally put on production – and produced no oil, only a small amount of natural gas. Essentially, this was another dry hole. In 1947, Newton sold the productive part of his Rangely lease to Stanolind for an undisclosed sum. Newton’s record of drilling deep Weber wells at Rangely was: four oil wells, all marginal, and all would water out quickly, plus a partial interest in one somewhat less marginal oil well. He also drilled four dry holes, although some of them were apparently completed in the shallow Mancos shale, and produced small amounts of oil. This is not a good record for a development project of this type. If Newton had acted prudently, at least two of the dry holes would have been avoided. Adding up Newton’s expenditures and income from the project, he probably lost something more than a million dollars at Rangely. That he lost money at Rangely is supported by fact that he never fully paid the $250,000 for the lease, and the Buckhold creditors were still suing him for payment in 1952. Perhaps not coincidentally, signs of Newton’s financial distress started in the late 1940s, followed shortly by accusations of fraud. 1) Silas Newton did not in any way discover or rediscover Rangely Field, or any of the major oil-bearing zones at Rangely. The history of Rangely oil field is too well-documented to admit of any doubt on this point. 2) Nor was the Rangely field discovered through the use of any geophysical device; it was found through basic geology and the willingness of Chevron to take a chance on drilling a deep hole. 3) Newton not only didn’t rediscover Rangely, but also probably lost a lot of money there. He drilled too many dry holes, and completed a few marginal producers. Five years after he sold out, he was still being sued for money he owed for buying the oil lease. Silas Newton’s falsehood that he had rediscovered the Rangely oil field is easily disproven. It was believed only because his audience – originally Frank Scully, was gullible, and also unlikely to do any minimal literature search, which would have exposed Newton’s nonsense. Today, Newton’s bragging imposes on the gullibility of a much larger audience. Did Newton find oil with a Magnetic Detection Device? Short answer: by reading Life magazine (Nov. 14, 1949: “Scientific weapons and a future war”) First, by Scully’s own account, he began writing the book in 1950, not 1949. Second, a cursory literature search shows that the magnetic detection of submarines during the war was public knowledge well before Scully started writing his book. The MAD program was publicized in such not-quite-top-secret documents as daily newspapers, Life magazine, Flying (Jan. 1947: “The MAD cats”), Science News Letter (Aug. 14, 1948: “Doodlebug hunts oil”), and Popular Science (Mar. 1950: “How good is our anti-submarine defense”). The Aztec UFO Incident creates a false dilemma by fudging Scully’s writing back one year, and by pretending that the existence of the magnetic submarine detection program was kept secret at least four years longer than it really was. 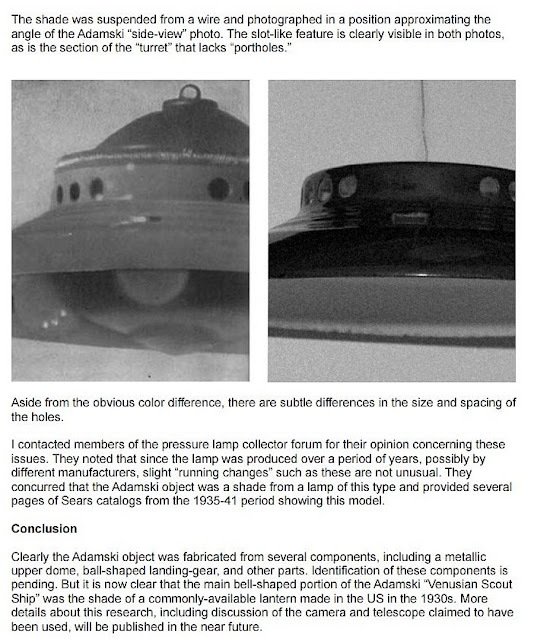 Scully’s knowledge of the program was sketchy at best, as shown by his wildly exaggerated statement (page 37 of Behind the Flying Saucers) that, using the magnetic detection, “we were able to knock out as many as 17 Jap subs in one day.” In fact, during the entire war, no more than two Japanese submarines ever sank, from all causes combined, in a single day. [x] The real question is not how Scully knew of the program, which was well known at the time, but which grossly unreliable source told him that magnetic detection had resulted in 17 submarines sunk in a single day? 1) The anti-submarine magnetic anomaly detection device, or MADD, was invented by the principals of GSI. 2) The MADD is known today as the Magnetron. 3) The MADD was kept secret into the 1950s, delaying its use in oil exploration. Fact: Gulf Research was in the business of selling geophysical services, and soon after the war they were promoting their airborne fluxgate magnetometer, in essence the MADD, to oil and mineral exploration. The wartime program and its application to oil exploration was described in technical detail in Geophysics (issues of July 1946 and April 1948), including a schematic of the fluxgate magnetometer. Geophysics, by the way, was mailed to each member of the Society of Exploration Geophysicists, in 1950 the membership was 2,566 scientists working in the field of finding oil and gas with geophysics. If you want to be a top scientist, you join such professional organizations to keep up with cutting-edge developments. Of course, Leo GeBauer and Silas Newton do not appear in the published membership lists of the Society of Exploration Geophysicists (I searched the lists from 1937 through 1950). Neither were GeBauer or Newton listed as members of the American Association of Petroleum Geologists; nor of the American Geophysical Union. Some top scientists. If Silas Newton was using a MADD-derived magnetic device to find oil, he was just one of many, because the technology was available to anyone. But whatever he was using, it obviously didn’t do him much good, based on his overwhelming lack of success in finding oil. The Aztec UFO Incident asserts that there is a genuine mystery behind the Aztec UFO crash. But the real mystery posed by the book is this: how can three authors, one of whom repeatedly brags about his 28 years of research on the topic, produce a book with so many careless errors of fact and logic? Dan Plazak is a geologist in Denver, and author of a history of swindling in the mining industry: A Hole in the Ground with a Liar at the Top (University of Utah Press, 2007), see www.miningswindles.com. He is currently working on a book about doodlebugs and other unscientific ways to search for oil and minerals. [i] W. Y. Pickering and C. L. Dorn, “Rangely oil field, Rio Blanco County, Colorado,” in J V. Howell (ed.) Structure of Typical American Oil Fields, v.3, (Tulsa: American Association of Petroleum Geologists, 1948) 132-152. [ii] Tolbert R. Ingram, “Rangely dome discovery of major importance; first oil producer in the Weber formation,” Oil & Gas Journal, 22 June 1933, p.119. Graham S. Campbell, “Weber pool of Rangely field, Colorado,” in Guidebook to the Geology of Northwest Colorado (Salt Lake: Intermountain Association of Petroleum Geologists, 1955) 99-100. [iii] “Old Rangely well opened after 10-year shutdown,” Oil & Gas Journal, 7 Oct. 1943, p103. C. R. Thomas, “Rangely, one-time shallow field, now Rocky Mountains’ most active area,” Oil & Gas Journal, 24 Nov. 1945, p.90-96. [iv] “Rangely field promises to become an active area,” Oil & Gas Journal, 30 Mar. 1944, p.132. [v] Oil Reporter (Denver) 25 Aug. 1945, p4. [vi] Oil Reporter (Denver), 25 Oct. 1945. [vii] Rangely oil field of Colorado has first failure,” Pampa (TX) Daily News, 14 June, p.6 c.4. “Rangely gets first dry hole in Weber,” Oil & Gas Journal, 29 June 1946, p.149. [viii] Oil Reporter (Denver), 25 Mar. 1947, p.6, 29 July 1947, p.10, 26 Aug. 1947, p.10. [ix] Charles Roos, “Newton oil firm due to answer contempt action,” Denver Post, 16 Oct. 1952. Capt. S. W. Roskill’s multivolume The War at Sea lists every Japanese submarine that sank during World War II, including dates, locations, and identification numbers. (London: HM Stationary Office, 1960, 1961) v.3 part 1 p.373-374, part 2 p.470-471. [xi] M. N. Nabighian and others, “The historical development of the magnetic method in exploration,” Geophysics, Nov.-Dec. 2005, v.70 n.6 p.37ND. [xii] M S. Reford and J. S. Sumner, “Aeromagnetics,” Geophysics, Aug. 1964, v. 29 n.4 p.483. [xiii] Caleb Pirtle III, Engineering the World: Stories from the First 75 Years of Texas Instruments (Dallas: Southern Methodist University Press, 2005) 28-30. [xiv] Albert W. Hull, “The magnetron,” Journal of the American Institute of Electrical Engineers, Sept. 1921, v.40 n.9 p.715-723. [xv] S. S. Swords, Technical History of the Beginnings of RADAR (Institution of Electrical Engineers, 1986) 258.